Prevention programs often are designed to enhance "protective factors" and to reduce "risk factors." Protective factors are those associated with reduced potential for drug use. Risk factors are those that make drug use more likely. Research asserts that for individuals who begin using illicit substances at an early age, several risk factors may increase the likelihood of continued and problematic use in later ages, when substance-related crime becomes much more likely.Footnote 1 Risk factors include: negative peer associations, unrealistic beliefs about the prevalence of illicit drug consumption, inconsistent or abusive parenting, school exclusion, and feelings of low self worth. Research has also demonstrated that many of the same risk and protective factors apply to other behaviors such as youth violence, delinquency, school dropout, risky sexual behaviors, and teen pregnancy. Risk and protective factors can be divided into five categories or domains: individual characteristics, peer group, school, family, and neighborhood/community. The relationship between the number and type of risk factors affects an individual's risk of becoming a substance abuser and/or engaging in delinquent behavior. With regards to substance use in the community domain, Arthur et al.Footnote 5 shows that neighborhoods where youths report low levels of bonding to the neighbourhood have higher rates of juvenile crime and drug use. Perceptions about the availability of cigarettes, alcohol, marijuana and other illegal drugs have been shown to predict rates of use of these substances. In the school domain, Arthur et al.Footnote 6 state that beginning in late elementary grades, academic failure increases the risk of both drug use and delinquency. Further, factors such as liking school, time spent on homework, and perceiving schoolwork as relevant are negatively related to drug use. At the level of the family it was found that parents who use illegal drugs, are heavy users of alcohol, or are tolerant of children's use, have children who are more likely to use drugs themselves. Other risk factors in the family domain are lack of family bonding (poor relationship), parental management (parental control) and family disturbance (conflict).Footnote 7 The strongest and most consistent evidence links family interaction to drug use. The key elements of family interaction are parental discipline, family cohesion and parental monitoring. At the peer or individual level, it is clear that the earlier the onset of any drug use, the greater the involvement in other drug use and the greater the frequency of use. Research shows that risk and protective factors are complex and take on varying levels of importance at different life stages. Associating with drug-abusing peers is a more significant risk factor in adolescence than childhood, when family focused risk factors typically have more influence. With numerous topical research studies emerging, new light is being shed on the relationship between drugs and crime. Although the relationship between drugs and crime is complex, research has brought forward relevant knowledge allowing practitioners and policy-makers to design frameworks and programming that address the risk factors for substance abuse and delinquency as they often overlap. According to the Canadian Addictions Survey 2005,Footnote 11 roughly 62.3% of youth aged 15-17 engaged in early use of alcohol and 29.2% in early cannabis use in the 12 months prior to the survey. The survey also shows that compared to earlier studies, the age of first use tends to be lower. Conversely, recent data from provincial student drug use surveys suggests that age of first use has risen in recent years. Nevertheless, early drug and alcohol use and later problematic use are known risk factors for future delinquency among youth. In fact, subsequent problematic substance abuse can lead to individuals engaging in criminal activity in order to support their addiction. Individuals most commonly engage in shoplifting, prostitution and breaking and entering as a method to obtain alcohol and illicit drugs.Footnote 12 Preventing substance abuse among youth will not only provide health benefits, but will also reduce the risk for future delinquent and criminal behavior as several risk and protective factors are common to both substance abuse and criminal behaviour. The Alberta Youth Experience Survey (TAYES, 2005) measured alcohol, tobacco, and illicit drug use among Alberta students in grades 7 through 12.Footnote 13 This survey states that 26.7% of students self-reported cannabis use within the twelve months prior to the survey. Also, 25.4% reported using any illicit drug (including cannabis) in the past year. The most commonly used illicit drugs were hallucinogens such as magic mushrooms followed by ecstasy, cocaine, solvents, stimulants, glue and crystal methamphetamine, in descending order. TAYES and other regional surveys on adolescent drug useFootnote 14 tend to confirm and substantiate the national prevalence findings on youth drug use (both licit and illicit). Research indicates that the Yukon, Northwest Territories and Nunavut have a large number of isolated Aboriginal communities, which have disproportionately high rates of illicit drug consumption when compared to the national average. In general, Aboriginal offenders in Canada report more serious substance abuse problems than non-Aboriginal offendersFootnote 15 with 38% of male Aboriginal offenders having serious problems with alcohol versus 16% of non-Aboriginal males. The 2002-2003 First Nations Regional Longitudinal Health Survey, indicates that the highest risk group for both drinking and drug use among Aboriginal people was young males aged 18-29. Regarding youth in custody, Justice CanadaFootnote 16 found that 57% of Aboriginal youth in custody had a confirmed substance abuse problem. Using data from the Canadian Addiction SurveyFootnote 17 it was estimated that 26.7% of youth were using tobacco in the twelve months prior to the survey. While the health risks of cigarette smoking are well known, what is not common knowledge is the finding that the use of tobacco by youth is associated with more frequent use of alcohol, cannabis and other illicit drugs, relative to youth who do not smoke.Footnote 18 Among those under age 20, smokers were 14 times more likely to consume alcohol than were their non-smoking peers and were also more likely to engage in binge drinking (five or more drinks on one occasion). DavisFootnote 19 claims that tobacco smoking in youth is a good indication that youth may be engaging in other risky behaviour. It is important to understand the issues facing youth at risk of using or already using drugs and alcohol because of the association with other antisocial and violent behaviors. The criminological literature is replete with studies that correlate drug involvement with criminal activity.Footnote 20 The black box in this area is not whether drug-related crime occurs, but rather the mechanics of how it occurs. For this, there is no ready answer. Rather, research findings reveal a gamut of responses which vary depending on the kind of drugs in question, individual factors, cohort demographics, psychological predispositions, economic circumstances, biological markers and environmental influences. However, these links will not be addressed as it is beyond the scope of this paper. The exact nature of the link between drugs and crime remains unclear and should be examined among different types of populations. However, common risk factors between drugs and crime as well as how crime and substance abuse can precipitate each other are the strongest known links. Pernanen and colleaguesFootnote 24 documented the proportions of crimes associated with alcohol and other drugs in Canada, and confirmed the close association between the use of psychoactive substances and criminal behaviour. Research suggests that substance use/abuse and involvement in crime, including drug, gun, and gang violence, have similar risk factors. These risk factors create different degrees of pressure on the individual and may give rise to high-risk behavior, which, in turn, lead to levels of substance use/abuse and crime that can be categorized according to a continuum of severity. As these actions progress along the continuum, substance use/abuse and antisocial deportment become more firmly entrenched, with one problem reinforcing the other, and vice versa. Research in the trajectories of young delinquents has also established that early, persistent delinquent behavior accompanied by substance abuse, is a strong predictor of an adult criminal trajectory. Social surveys have demonstrated an increase in the rates of self-reported problem use of illegal substances since 1990Footnote 25 and higher levels of acceptance of drug use among youth.Footnote 26 In a recent study of self-reported delinquency of youth in Toronto,Footnote 27 alcohol and drug abuse was more widespread among delinquent youth. Those who reported never engaging in delinquent behaviour were less likely to have used alcohol (34%) and to have gotten drunk (23%) than those who stated they had engaged in one or more types of delinquent behaviour (73% and 48% respectively). In addition, jurisdictions with a high youth population may also have elevated rates of drug-related offencesFootnote 28 as youth are disproportionally more likely to engage in substance abuse compared to adults. Rates per 100,000 people for drug-related violations in 2002 were highest for individuals between the ages of 18 and 24 in 2002 followed by 12-17 year-olds. Erickson & ButtersFootnote 29 also found that for Toronto youth who were not attending school regularly, and for youth who were in custody, selling drugs significantly increased the odds of committing gun violence against others. Substance abuse, particularly alcohol, may be a precipitating or aggravating factor in the commission of an offence by either impairing an individual's ability to respond appropriately to difficult situations or by rendering individuals more vulnerable to victimization. The 2004 General Social Survey on VictimizationFootnote 30 reports that in roughly 52% of violent incidents, the victim believed that the incident was related to the offender's use of alcohol or drugs.Footnote 31 Moreover, multiple studies have documented the strong link between consumption and sexual assault. In fact,more than half of offenders have consumed alcohol or drugs before committing a sexual assault.Footnote 32 Factors that may explain both drug use and criminal activity include poverty, lack of social values, personality disorders, association with drug users and/or delinquents, and loss of contact with agents of socialization. The good news for practitioners is that a large number of school-based drug prevention programs have been researched and evaluated. This is not to say that there isn't a need to raise the rigor of evaluations and conduct more meta-analyses and systematic reviews, but rather that the good work that has been done in this field has provided concrete, attainable processes and strategies for program practitioners to follow. This section outlines some key lessons to keep in mind in implementing school-based drug prevention programs. Affective education programs which focus on building self-esteem, responsible decision-making, and interpersonal growth. Studies suggest that the reason why these components of drug prevention programs work is because they begin from the premise that youth behaviours in regards to alcohol and drug use are strongly affected by social context, biological and emotional needs, and real and imaginary pressure from peers and others. Interventions that focus solely on healthy attitudes and providing factual information in a classroom setting, fail to take environmental pressures into account at their own peril. More comprehensive social competency promotion programs work better than programs which do not focus on social competencies and those that focus more narrowly on resistance skills training. Cognitive behavioral training methods such as feedback, reinforcement, and behavioral rehearsal are more effective than traditional lecture and discussion. It is clear that the 'didactic' approach is not as well received as an interactive, creative approach. The 'social influences' approach — based on the belief that young people begin to use drugs because of their self-image and/or social pressures — is promising. This approach suggests that, in order to resist substances, young people need to be able to use counter arguments effectively.Footnote 42 Skara & Sussman,Footnote 43 in their summary of the effectiveness of program evaluation studies, found long-term empirical evidence of effectiveness of social influences programs in preventing or reducing substance use for up to 15 years after completion of programming. The evidence suggests that teachers ought to employ 'normative' information in their approach. Students tend to over-estimate the extent to which their peers use drugs, miscalculating what is the 'normal' level of experience with drugs. Normative components may play a critical role in encouraging students to use peer resistance strategies. In the absence of a normative component, research reveals that resistance training appeared relatively ineffective. Attention needs to be paid to the manner in which drug-education programs are carried out by teachers.Footnote 44 Program fidelity is quite important from an evidence-based approach, while considering that programs are also implemented and adapted to the local priorities related to drugs and crime. Those teaching the program need to be engaging, youth focused and interactive. In fact, it has been shown that young people use drug prevention information if it is accurate, honest and delivered by people they trust. Finally, successful school-based programs are often implemented as part of a broader integrated effort to address drug and crime problems in the local community. Even when considered exemplary, programs are not guaranteed to work in a different context. Effects of a program do not last over the longer term. Problems that typically arise in the evaluation phase of school-based drug prevention programs include group randomization, lack of consent to participate, attrition from the study, and influential interactions among participants within a study.Footnote 46 In the case of drug prevention programs, it is especially problematic if those who could potentially derive the most benefit from the program are also those who are unlikely to receive consent to participate in the first place or dropout from the program before completion. While this knowledge could lead to a pessimistic view of school-based drug prevention programs, it serves a better purpose in guarding against unrealistic expectations in terms of achieving sustained behavioral outcomes. It also underlines the need for processes and evaluations that are rigorous, consistent, transparent and of a longer term nature than is presently the case. The literature suggests that school-based drug prevention programs ought to be but one piece of a larger picture. That larger picture involves a broader scale, community wide effort that organizes the strengths and resources of multiple agencies to combat drug use and crime. Given that local tailoring of programs and contextual adaptation is fundamental to program success, what is of greater significance than merely copying a program is to ensure that the principles that are found in the most promising and successful programs are considered when developing any drug prevention program. Prevention programs can be implemented in various settings such as the school, community and family. Youth spend much of their time in a school environment, and schools are important places to implement prevention programs that seek to reduce (and eliminate) the risk of engaging in early use and future delinquency. School-based settings provide opportune environments in which to provide knowledge and tools to prevent and reduce youth drug involvement. This section summarizes key aspects of effectiveFootnote 51 school-based approaches. Programs are distinguished between targeted programsFootnote 52 (SUCCESS and TND) and universal programsFootnote 53 (ALERT and LST). Project SUCCESS (Schools Using Coordinated Community Efforts to Strengthen Students), is a program specifically designed for high-risk youth (a targeted intervention). The program places highly trained professionals in schools to provide a range of substance use prevention and early intervention services. Project SUCCESS was tested with 14 to 18-year-old adolescents who attended an alternative school that separated them from the general school population. Participants typically came from low to middle income, multi-ethnic families. SUCCESS claims to prevent and reduce substance use among high-risk, multi-problem high school adolescents. Project SUCCESS works by building partnerships established between a prevention agency and alternative school. A trained individual who is experienced in providing substance abuse prevention counseling to adolescents is recruited to work in the alternative school as a Project SUCCESS Counselor (PSC). This individual will provide the school with substance abuse prevention and early intervention services to help decrease risk factors and enhance protective factors related to substance abuse. Prevention Education Series—An eight-session substance abuse prevention education program conducted by the PSC. Individual and Group Counseling—Following assessment, a series of eight to twelve time-limited individual or group sessions is conducted in the school. Parent Programs—Project SUCCESS includes parents as collaborative partners in prevention through parent education programs. Referral—Students and parents who require treatment, more intensive counseling, or other services are referred to appropriate agencies or practitioners in the community. Decreased associations with peers who used substances. Used a substance when alone. Project SUCCESS was found to be effective with both genders, students from various ethnic groups, and across grade levels from the 9th to 12th grades. SUCCESS stands for Schools Using Coordinated Community Efforts to Strengthen Students. Decreased substance use found across ethnicities and grade levels. Project Toward No Drug Abuse (TND) is a targeted intervention and interactive program designed to help high school youths (ages 14–19) resist substance use. This school-based program consists of twelve 40- to 50-minute lessons that include motivational activities, social skills training, and decision-making components that are delivered through group discussions, games, role-playing exercises, videos, and student worksheets over a four week period. The program was originally designed for high-risk youth in alternative high schools and consisted of nine lessons developed using a motivation-skills–decision-making model. It addresses topics such as active listening skills, effective communication skills, stress management, coping skills, tobacco cessation techniques and self-control—all to counteract risk factors for drug abuse relevant to older teens. Project TND has been rigorously evaluated. Results show that TND led to significant reductions in hard drug and alcohol use.Footnote 60 An evaluation of approximately 2,500 alternative high school studentsFootnote 61 from 42 high schools in Southern California revealed that those who received the intervention showed roughly half the monthly drug use frequency at follow-up as those in the control condition. The evaluation conducted on mainstream high school students also showed a significant reduction in hard drug and alcohol use among intervention students at the one year follow-up.Footnote 62 When looking at the perpetration of violence in alternative high school youth at the one year follow-up, males in the treatment groups had a significantly lower risk of victimization than the control group. They were also less likely to carry weapons. ALERT is a science-based program, meaning that its effectiveness has been demonstrated through rigorous (criteria typically include research design, deterrent effect, sustainability and replicability) research and in 2001, the US Department of Education named ALERT an exemplary model program. ALERT, unlike some other American programs, addresses substance misuse rather than simply use, because of the widespread acceptance of these substances amongst youth. ALERT and many other school-based drug prevention programs draw on the tenets of social learning theory. Social learning theory focuses on the learning that occurs within a social context, and considers that people learn from one another through observation, imitation and modeling. Basically, social learning theory says that people can learn by observing others' behavior and the outcomes of those behaviors; that learning may or may not result in a behavior change; and that cognition plays a role in learning. Accordingly, awareness and expectations of future reinforcements and punishments can have a major effect on the person's behaviors. Outcome findings from ALERTFootnote 66 showed that the program helped youth avoid risky drinking, but it did not keep students from starting to drink or help them cut back on moderate consumption. For all students, alcohol misuse scores were lower by 24% for the ALERT group after the eighteen month evaluation. For cigarette use, the ALERT group was 19% lower. The LST prevention program is a three year intervention designed to be conducted in school classrooms. LST targets tobacco, alcohol, and marijuana and offers the potential for interrupting the normal developmental progression from use of these substances to other forms of drug use/abuse. The LST program has been designed to target the psychosocial factors associated with the onset of drug involvement. The program impacts on drug-related knowledge, attitudes and norms, drug-related resistance skills, and personal self-management and social skills. Increasing prevention-related drug knowledge and resistance skills can provide adolescents with the information and skills needed to develop anti-drug attitudes and norms, as well as to resist peer and media pressure to use drugs. Teaching effective self-management skills and social skills (improving personal and social competence) offers the potential of producing an impact on a set of psychological factors associated with decreased drug abuse risk (by reducing intrapersonal motivations to use drugs and by reducing vulnerability to pro-drug social influences). The LST program consists of 15 class periods of 45 minutes each and is intended for junior high school students. A booster intervention has also been developed which consists of ten class periods in the second year and five class periods in the third year. The rationale for implementing the LST program at this point relates to the developmental progression of drug use, normal cognitive and psychosocial changes occurring at this time, the increasing prominence of the peer group, and issues related to the transition from primary to secondary school. While the program is effective with just the one year of primary intervention, researchFootnote 69 has shown that prevention effects are greatly enhanced when booster sessions are included. For example, Botvin et al.Footnote 70 have shown that one year of the primary intervention of LST produced reductions of 56-67 percent in smoking without any additional booster sessions; but for those students receiving booster sessions, these reductions were as high as 87 percent. In addition, the booster sessions enhance the durability of prevention effects, so that they do not decay as much over time. LST has been shown to be effective using a variety of service providers including outside health professionals, regular classroom teachers, and peer leaders. Peer counselors are often slightly older (high school) and almost always work in conjunction with a trained adult provider. Research has shown that participation in the LST program can cut drug use in half.Footnote 71 These reductions (in both the prevalence and incidence)Footnote 72 of drug use have primarily been with respect to tobacco, alcohol, and marijuana use. For example, long-term follow-up data indicate that reductions in drug use produced with seventh graders can last up to the end of high school. Evaluation research has demonstrated that this prevention approach is effective with a broad range of students. It has not only demonstrated reductions in the use of tobacco, alcohol, or marijuana use of up to 80 percent, but evaluation studies show that it also can reduce more serious forms of drug involvement such as the weekly use of multiple drugs or reductions in the prevalence of pack-a-day smoking, heavy drinking, or episodes of drunkenness. Classroom-based three year intervention program. Aimed at elementary, junior and high school students. Designed to target the psychosocial factors associated with the onset of drug involvement. Developed to impact on drug-related knowledge, attitudes and norms; teach skills for resisting social influences to use drugs; and promote the development of general personal self-management skills and social skills. Has three main components - The first component is designed to teach students a set of general self-management skills. The second component focuses on teaching general social skills. The third component includes information and skills that are specifically related to the problem of drug abuse. Variety of service providers such as outside health professionals, regular teachers or peer leaders. Consists of 15 sessions of 45 minutes each, followed by a booster of 10 sessions in the following year and five sessions in the last year. Demonstrated reductions of up to 80% in the use of tobacco, alcohol or marijuana. Cited as effective and/or exemplary by several agencies. Youth spend much of their time in a school environment, and schools are important places in which to provide knowledge and tools to prevent and reduce youth drug involvement. Successful school-based prevention programs, targeting those most at-risk, contribute to reduce drug-related crime. Schools provide an opportune environment to implement prevention programs that seek to reduce the risk factors and increase the protective factors of substance use and abuse and future delinquency among youth. School-based drug prevention programs that are targeted, evidence-based, interactive, youth-focused and, engaging, have been shown to have success in reducing drug abuse. Overall, successful school-based programs have been shown to have interventions delivered by trained professionals, limited number of students, intense contact, and booster sessions for youth most at-risk at the latter stage of the intervention. These promising and effective prevention programs also often combine community partnerships with intervention components that are known to work and use trained, knowledgeable and committed personnel that can genuinely relate with and engage youth. Early use and later problematic use are risk factors for future delinquency. Numerous studies have documented the strong link between alcohol and drug consumption and crime. Alcohol and drugs are often intimately linked to the commission of criminal acts. For example, in Canada, 14% of federal inmates reported having been under the influence of both alcohol and drugs at the time they committed their most serious offence. In total 30% of federal inmates committed their most serious crime at least under the partial influence of drugs, and 38% committed this crime at least in part under the influence of alcohol.Footnote 73 Prevention programs successful in reducing and/or preventing the number of individuals who abuse alcohol and drugs contribute to reductions in later delinquency. Adlaf, E. M., & Paglia, A. 2001. Drug Use Among Ontario Students, 1977-2001: Findings from the OSDUS (CAMH Research Document No. 10). Toronto: Centre for Addiction and Mental Health. Alberta Alcohol and Drug Abuse Commission. 2006. The Alberta Youth Experience Survey (TAYES) 2005 / prepared by Jodi Lane. Edmonton: Alberta Alcohol and Drug Abuse Commission. Arthur, Michael W. et al. 2002. "Measuring Risk and Protective Factors for Use, Delinquency, and Other Adolescent Problem Behaviors". Evaluation Review, 26(6): 575-601. Assembly of First Nations. 2003. First Nations Regional Longitudinal Health Survey, 2002-2003. Ottawa: RHS National Team, Health and Social Secretariat. Baron, Stephen W. 1999. "Street Youths and Substance Use – The Role of Background, Street Lifestyle, and Economic Factors." Youth & Society, 31(1): 3-26. Barton, A. and R. Teagle. 2007. "Police-Led Proactive Prevention of Youth Crime: A Case for The Innovative Use of Support Workers?" Crime Prevention and Community Safety, (9): 21-33. Bell, R. M., P. L. Ellickson and E. R. Harrison. 1993. "Do Drug Prevention Effects Persist Into High School? How Project ALERT Did with Ninth Graders." Preventive Medicine, 22(4): 463-83. Bennett, T. and K. Holloway. 2005. "The Association Between Multiple Drug Misuse and Crime." International Journal of Offender Therapy and Comparative Criminology, 49(1): 63-81. Botvin, G.J., E. Baker, L. Dusenbury, E. M. Botvin and T. Diaz. 1995. "Long-Term Follow-Up Results of a Randomized Drug Abuse Prevention Trial in a White Middle-Class Population." JAMA, 273(14): 1106-12. Botvin, G. J., S. F. Mihalic and J. K. Grotpeter. 1998. "Book 5: Life Skills Training." In Blueprints for Violence Prevention. Boulder, CO: Center for the Study and Prevention of Violence. Botvin, G. J. et al. 2001. "Preventing Binge Drinking During Early Adolescence: One and Two Year Follow-Up of a School-Based Preventive Intervention." Psychology of Addictive Behaviors, 15(4): 360-365. Botvin, G. J., K. W. Griffin and Tracy Diaz Nichols. 2006. "Preventing Youth Violence and Delinquency Through a Universal School-Based Prevention Approach." Prevention Science, (7): 403-408. Brochu, S. 2006. "Evidence-Based Drug Policies." Journal of Scandinavian Studies in Criminology and Crime Prevention, (7): 36-45. Brounstein, P., & J. Zweig. 1999. Understanding Substance Abuse Prevention: Toward the 21st Century: A Primer on Effective Programs. [Rockville, MD]: Substance Abuse and Mental Health Services Administration, Center for Substance Abuse Prevention, Division of Knowledge Development and Evaluation. Canada. Department of Justice. Research and Statistics Division. 2002. A One-Day Snapshot of Aboriginal Youth in Custody across Canada. Ottawa: Department of Justice Canada. Canada. Indian and Northern Affairs Canada. 2006. Aboriginal Women and Family Violence: Final Report. Gatineau, Québec: Indian and Northern Affairs Canada. Canada. Statistics Canada. 2004. General Social Survey. Cycle 18. Victimization, 2004. Ottawa: Statistics Canada. Canada. Statistics Canada. 2005. Criminal Justice Indicators, 2005. Ottawa: Canadian Centre for Justice Statistics. Canada. Statistics Canada. 2007. Youth Self-Reported Delinquency, Toronto, 2006. Ottawa: Canadian Centre for Justice Statistics. Canada. Canadian Centre on Substance Abuse. 2005. Canadian Addiction Survey: A National Survey of Canadians' Use of Alcohol and Other Drugs: Prevalence of Use and Related Harms: Detailed Report. Ottawa: Canadian Centre on Substance Abuse (CCSA). Canadian Public Health Association. 2004. "A Health Care Needs Assessment of Federal Inmates in Canada". Canadian Journal of Public Health, 95:Suppl. 1 (March-April). Caulkins, J. P., et al. 2004. "What We Cannot Expect From School-Based Drug Prevention." Drug & Alcohol Review, (23): 79-87. Centre for Addiction and Mental Health. 1999. Alcohol and Drug Prevention Programs for Youth: What Works? Toronto: Centre for Addiction and Mental Health. Chou, C. P., S. Montgomery, M. P. Pentz, et al. 1998. "Effects of a Community-Based Prevention Program on Decreasing Drug Use in High-Risk Adolescents." American Journal of Public Health, (88): 944-948. Collin, Chantal. 2006. Substance Abuse Issues and Public Policy in Canada. Ottawa: Parliamentary Information and Research Service. Cornell, D. G. 1999. What Works in Youth Violence Prevention. Charlottesville, VA: Curry School of Education, University of Virginia. Available from: http://youthviolence.edschool.virginia.edu/pdf/worksch.pdf. Cornell, D. G., et al. 1999. Youth Violence Prevention in Virginia: A Needs Assessment. Charlottesville, VA: Virginia Youth Violence Project, Curry School of Education, University of Virginia. Cuijpers, P. 2002. 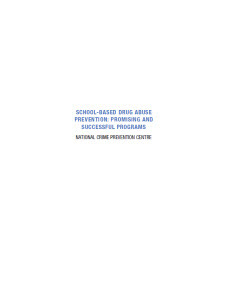 "Effective Ingredients of School-Based Drug Prevention Programs. A Systematic Review." Addiction Behavior, 27(6):1009-23. D'Amico, Elizabeth J. "Factors that Impact Adolescents' Intentions to Utilize Alcohol-Related Prevention Services." The Journal of Behavioral Health Services & Research, Brief Reports, (32): 3. Davis, C. G. 2006. Risks Associated with Tobacco Use in Youth Aged 15 to 19: Analysis Drawn from the 2004 Canadian Addiction Survey. Ottawa: Canadian Centre on Substance Abuse. Dell, Colleen Anne, Tara D. Beauchamp. 2006. Youth Volatile Solvent Abuse FAQs. Ottawa, ON: Canadian Centre on Substance Abuse. Dembo, R., L. Williams, L. La Voie et al. 1990. "A Longitudinal Study of the Relationships Among Alcohol Use, Marijuana/Hashish Use, Cocaine Use, and Emotional/Psychological Functioning Problems in a Cohort of High-Risk Youths." International Journal of Addiction, 25(11): 1341-82. Derzon, James, H. and Mark W. Lipsey. 1999. "What Good Predictors of Marijuana Use are Good For – A Synthesis of Research." School Psychology International, 20(1): 69-85. Desjardins, N. and T. Hotton. 2001. "Trends in Drug Offences and the Role of Alcohol and Drugs in Crime." Juristat, 24(1). Dusenbury, L., M. Falco and A. Lake. 1997. "A Review of the Evaluation of 47 Drug Abuse Prevention Curricula Available Nationally." Journal of School Health, 67(4):127-32. Dusenbury, L., and M. Falco. 1995. "Eleven Components of Effective Drug Abuse Prevention Curricula." Journal of School Health, 65(10): 420-5. Elliot, D., D. Huizinga and S. Menard. 1989. Multiple Problem Youth: Delinquency, Substance Abuse and Mental Health Problems. New York; Springer-Verlag. Elliott L., L. Orr, A. Jackson and L. Watson. 2005. "Secondary Prevention Interventions for Young Drug Users: A Systematic Review of the Evidence." Adolescence, 40(157): 1-22. Ennett, S. T. et al. 2003. "A Comparison of Current Practice in School-Based Substance Use Prevention Programs with Meta-Analysis Findings." Prevention Science, 4(1): 1-14. Erickson, Patricia G. and Jennifer E. Butters. 2006. "Final Report: Youth, Weapons and Violence in Toronto and Montreal." Report prepared for Public Safety & Emergency Preparedness Canada. Ottawa: Public Safety Canada. Faggiano, F. et al. 2005. "School-Based Prevention for Illicit Drugs' Use." Cochrane Database Systematic Review, 18(2). Farrington, D. P. and Brandon C. Welsh. 2007. Saving Children From a Life of Crime – Early Risk Factors and Effective Interventions. Oxford, New York: Oxford University Press. Finke, L. et al. 2002. "Survival Against Drugs: Education for School-Age Children." Journal of Child and Adolescent Psychiatric Nursing, 15(4):163-169. Foxcroft, D. A., D. Lister-Sharp and G. Lowe. 1997. "Alcohol Misuse Prevention for Young People: a Systematic Review Reveals Methodological Concerns and Lack of Reliable Evidence of Effectiveness." Addiction, 92(5): 531-538. France, A. and I. Crow. 2005. "Using the Risk Factor Paradigm in Prevention: Lessons From the Evaluation of Communities That Care." Children & Society, (19): 172-184. Ghosh-Dastidar, Bonnie, et al. 2004. "Modifying Pro-Drug Risk Factors in Adolescents: Results from Project ALERT." Health Education Behaviour, 31(3): 318-334. Goren, N. and K. Wright. 2006. "Peer Education as a Drug Prevention Strategy." Drug Info Clearinghouse Prevention Research, (17). Gorman, Dennis M. 2003. "Alcohol & Drug Abuse: The Best of Practices, the Worst of Practices: The Making of Science-Based Primary Prevention Programs." Psychiatric Services, 54(8): 1087-1089. Gottfredson, D. C. 2001. "Chapter 5: School-Based Crime Prevention." In Sherman, Lawrence et al. Preventing Crime: What Works, What Doesn't, What's Promising. A Report to the United States Congress. National Institute of Justice, Department of Justice, US. Gottfredson, D. C., and David A. Soule. 2005. "The Timing of Property Crime, Violent Crime, and Substance Use Among Juveniles." Journal of Research in Crime & Delinquency, 42(1): 110-120. Gruner-Gandhi, A., et al. 2007. "The Devil is in the Details: Examining the Evidence for 'Proven' School-Based Drug Abuse Prevention Programs." Evaluation Review, (31): 43-74. Hallfors, D., and D. Godette. 2002. "Will the 'Principles of Effectiveness' Improve Prevention Practice? Early Findings from a Diffusion Study." Health Education Research, 17(4): 461-470. Hastings, R. 2007. "Introduction to the Inaugural Volume of the Institute for the Prevention of Crime Review." IPC Review, (1): 1-5. Hawkins, J. 1999. "Preventing Crime and Violence through Communities That Care." European Journal on Criminal Policy and Research, 7(4): 443-458. Hawkins, J. D., M. L. Van Horn, and Michael W. Arthur. 2004. "Community Variation in Risk and Protective Factors and Substance Use Outcomes." Prevention Science, 5(4): 213-220. Herrenkohl, T. I., et al. 2007. "Risk Factors for Violence and Relational Aggression in Adolescence." Journal of Interpersonal Violence, 22(4): 386-405. Herrenkohl, T. I., et al. 2000. "Developmental Risk Factors for Youth Violence". Journal of Adolescent Health, 26: 176-186. Hewitt, D., G. Vinje, and P. MacNeil. 1995. "Young Canadians' Alcohol and Other Drug Use: Increasing Our Understanding." Canada's Drug Strategy: Horizon's Three. Canada: Health Canada. Hollist, Dusten R. and McBroom, William H. 2006. "Family Structure, Family Tension, and Self- Reported Marijuana Use: A Research Finding of Risky Behavior Among Youths." Journal of Drug Issues, 36(4): 975-998. Ireland, T. O., Smith, C. A., and Terence P. Thornberry. 2002. "Developmental Issues in the Impact of Child Maltreatment on Later Delinquency and Drug Use." Criminology, 40(2): 359-399. Kandel D. B., Logan J. A. 1984. "Patterns of Drug Use from Adolescence to Young Adulthood: Periods of Risk for Initiation, Continued Use, and Discontinuation". American Journal of Public Health, 74:660-666. Kleinig, J. and S. Einstein (eds.). 2006. Ethical Challenges for Intervening in Drug Use: Policy, Research and Treatment Issues. Huntsville, Texas: Office of International Criminal Justice (OICJ). Latimer, Jeff and Laura Casey Foss. 2004. A One-Day Snapshot of Aboriginal Youth in Custody across Canada: Phase II. Ottawa: Department of Justice Canada. Lo, C. C., and T. C. Cheng. 2007. "The Impact of Childhood Maltreatment on Young Adults' Substance Abuse." American Journal of Drug and Alcohol Abuse, 33(1): 139-46. Loeber, R. et al. 1998. "The Development of Male Offending: Key Findings from the First Decade of the Pittsburgh Youth Study." Studies in Crime and Crime Prevention, 7: 141-172. LoSciuto, L., et al. 1996. "An Outcome Evaluation of Across Ages: An Intergenerational Mentoring Approach to Drug Prevention." Journal of Adolescent Research, 11(1): 116-129. Loxley, W. M., J. W. Toumbourou, and Timothy R. Stockwell. 2005. "A New Integrated Vision of How to Prevent Harmful Drug Use." The Medical Journal of Australia, 182(2): 54-55. McBride, N. 2003. "A Systematic Review of School Drug Education." Health Education Research, 18(6): 729-742. Melrose, M. 2004. "Fractured Transitions: Disadvantaged Young People, Drug Taking and Risk." The Journal of Community and Criminal Justice NAPO, 51(4): 327-341. National Institute on Drug Abuse (NIDA). 2003. Preventing Drug Use Among Children and Adolescents: A Research-Based Guide for Parents, Educators and Community Leaders. 2nd ed. [Washington, D.C.]: National Institute on Drug Abuse, National Institutes of Health. Paglia, A., and R. Room. 1998. Preventing Substance Use Problems Among Youth: A Literature Review & Recommendations. Addiction Research Foundation Division, Centre for Addiction and Mental Health. Research Document No. 142. Pernanen, K. et al. 2002. Proportions of Crimes Associated With Alcohol and Other Drugs in Canada. Ottawa: Canadian Centre on Substance Abuse. Petrosino, A., et al. 2006. "US State Government and DARE: the Story in Four States." Evidence & Policy, 2(3): 291-319. Petrosino, A. and J. Lavenberg. 2007. "Systematic Reviews and Meta-Analyses: Best Evidence on "What Works" for Criminal Justice Decision Makers." Western Criminology Review, 8(1):1-15. Poulin, C., L. Van Til, and B. Wilbur. 1999. "Alcohol and Other Drug Use Among Adolescent Students in Atlantic Provinces". Canadian Journal of Public Health, 90:27-29. RAND Corp. 2003. What Are the True Benefits of School-Based Drug Prevention Programs? Santa Monica, CA: Rand Corp.
Ringwalt, C. L., et al. 2002. "The Prevalence of Effective Substance Use Prevention Curricula in U.S. Middle Schools." Prevention Science, 3(4): 257-265. Roberts, G., et al. 2001. Preventing Substance Use Problems Among Young People: A Compendium of Best Practices. Ottawa: Health Canada. Robertson, E. B., S. L. David, and Suman. A. Rao. 1997. Preventing Drug Use Among Children and Adolescents – A Research Based Guide for Parents, Educators, and Community Leaders. 2nd ed. Betheseda, MD: US Department of Health and Human Services, National Institutes of Health, National Institute on Drug Abuse (NIDA). Rosenbaum, D., and G. Hanson. 1998. "Assessing the Effects of School-Based Drug Education: Six Year Multilevel Analysis of Project D.A.R.E.." Journal of Research in Crime & Delinquency, 35(4): 381-412. Sallybanks, J., and Wendy Taylor. 2003. What Works in Reducing Young People's Involvement in Crime? The Review of Current Literature on Youth Crime Prevention. Canberra: Australian Institute of Criminology. Available from: http://www.cmd. Sambrano, S., et al. 2005. "Understanding Prevention Effectiveness in Real-World Settings: The National Cross-Site Evaluation of High Risk Youth Programs." The American Journal of Drug and Alcohol Abuse, (31):491-513. Sanci, L., et al. 2002. "Drug Education Approaches in Secondary Schools." Prevention Research Evaluation Report, Number 3. Drug Info Clearinghouse, Australian Drug Foundation. Melbourne: Australian Drug Foundation. Available from: www.druginfo.adf. Schroeder, R. D., P. C. Giordano and Stephen A. Cernkovich. 2007. "Drug Use and Desistance Processes." Criminology, 45(1): 191-222. Skara, S., and S. Sussman. 2003. "A Review of 25 Long-Term Adolescent Tobacco and Other Drug Use Prevention Program Evaluations." Preventive Medicine, 37(5): 451-74. Sommers, I., and D. Baskin. 2006. "Methamphetamine Use and Violence." The Journal of Drug Issues, Winter 2006: 77-96. Springer, J. F. et al. 2002. The National Cross-Site Evaluation of High-Risk Youth Programs. Monograph Series. No.1. Center for Substance Abuse Prevention. SAMHSA. Stephenson, M. 2007. Young People and Offending – Education, Youth Justice and Social Inclusion. Cullompton: Willan Publishing. Stockburger, J. et al. 2005. Youth Voices on the Prevention and Intervention of Youth Substance Abuse. UNBC Taskforce on Substance Abuse, Centre of Excellence for Children and Adolescents with Special Needs. Stoolmiller, M., and E. A. Blechman. 2005. "Substance Use is a Robust Predictor of Adolescent Recidivism." Criminal Justice and Behavior, 32(3): 302-328. Tatchell, T. W., et al. 2004. "Substance Abuse Prevention in Sixth Grade: The Effect of a Prevention Program on Adolescents' Risk and Protective Factors." American Journal of Health Studies, 19(1): 54-61. Tobler, N. S., et al. 1999. "Effectiveness of School-Based Drug Prevention Programs for Marijuana Use." School Psychology International, 20(1): 105-137. Trocmé, N. 2003. Canadian Incidence Study of Reported Child Abuse and Neglect – 2003: Major Finding. Ottawa: Public Health Agency of Canada. Wall, A. E., and Patricia L. Kohl. 2007. "Substance Use in Maltreated Youth: Findings from the National Survey of Child and Adolescent Well-Being." Child Maltreatment,12(1): 20-30. Weekes, J. R., A. E. Moser and C. M. Langevin. 1999. "Assessing Substance-Abusing Offenders for Treatment". In E. J. Latessa (Ed.) Strategic Solutions: The International Community Corrections Association Examines Substance Abuse. Lanham, MD: American Correctional Association Press. West, S. L. and Keri K. O'Neal. 2004. "Project D.A.R.E. Outcome Effectiveness Revisited." American Journal of Public Health, 94(6): 1027-1029. White, Helene R. 1992. "Early Problem Behaviour and Later Drug Problems." Journal of Research in Crime & Delinquency, 29(4): 412-429. White, H. R., and D. M. Gorman. 2000. "Dynamics of the Drug Crime Relationship," In Lafree, G. (ed.) Criminal Justice 2000: Volume 1: The Nature of Crime: Continuity and Change, NCJ 182408, National Institute of Justice, USA, 151 to 218. Wolfe, David A., Claire Crooks, Debbie Chiodo et al. 2005. The Fourth R Interim Evaluation Report: Impact of a Comprehensive School-Based Prevention Program: Changes in Adolescents' Knowledge, Attitudes and Behaviour Related to Violence, Sexual Behaviour and Substance Use. CAMH Centre for Prevention Science & Centre for Research on Violence against Women and Children. 1 Health Canada, 2001; Statistics Canada, 2004; CCSA, 2005. 2 Loeber et al. 1998. "The development of male offending: Key findings from the first decade of the Pittsburgh Youth Study." Studies in Crime and Crime Prevention, 7: 141-172. 3 Herrenkohl et al. 2000. "Developmental risk factors for youth violence." Journal of Adolescent Health, 26: 176-186. 4 This table is an adapted version of the table on Risk and Protective Factors in Arthur and al. 2002:579-583. 5 Arthur et al., 2002. 7 Frisher et al., 2005. 9 Arthur et al., 2002:581. 10 Statistics Canada, 2006: 6. 11 Canadien Centre on Substance Abuse (CCSA), 2005. 12 Pernanen et al., 2002. 13 Jodi Lane. Alberta Youth Experience Survey, 2005. Alberta Alcohol and Drug Abuse Commission. 3,915 students participated in the survey. The results should be interpreted with caution because of limitations of sampling across Alberta. 14 See http://www.ccsa.ca for further Student Drug Use Statistics in Canada. 15 Weekes, et al., 1999; Canadian Public Health Association, 2004. 20 Hammersley, 2003:1; Reuter and Stevens, 2007:33. 21 Elliot, Huizinga and Menard, 1989; Kandel and Logan, 1984. 22 Elliot et al., 1989. 23 For more information on drugs & crime, http://www.emcdda.europa.eu 'Drugs in Focus' is a series of policy briefings published by the European Monitoring Centre for Drugs and Drug Addiction (EMCDDA), Lisbon. 25 Health Canada, 2001; CCSA, 2005; Adlaf and Paglia 2001; Poulin, VanTil and Wilbur 1999. 26 Health Canada, 2001; CCSA, 2005. 27 The target population for the Toronto survey consists of students in grades 7, 8, and 9 attending schools in the Toronto census subdivision. 3,290 questionnaires were completed by students. It is important to keep in mind that self-reported delinquency surveys are not without their limitations; Statistics Canada, 2006:9. 28 Juristat, CCJS, Statistics Canada, 2004, Trends in Drug Offences and the Role of Alcohol and Drugs in Crime by Desjardins and Hotton. 29 Erickson and Butters, 2006. 30 In 2004, as part of its General Social Survey program, Statistics Canada conducted a survey on victimization and public perceptions of crime and the justice system. The target population was Canadians aged 15 years and older living in the ten provinces. 31 Criminal Justice Indicators, 2005. 32 Lopez and Sansfaçon, 2005. 34 Lo and Cheng, 2007. 35 Ireland et al., 2002. 36 Lopez and Sansfaçon, 2005. 37 Erickson and Butters, 2006. 39 Faggiano et al., 2005. 40 Bell et al., 1993. 41 Botvin et al., 1995. 43 Skara and Sussman, 2003. 44 Hallfors and Godette, 2002. 45 Gruner-Gandhi and colleagues (2007) examined the evidence used by seven prominent best-practice lists to select their model prevention programs. Their research raises questions about the process used to identify and publicize programs as successful. They found limited evidence showing substantial impact on drug use behavior at posttest (a test given to students after completing a lesson, intervention or program), with very few studies showing substantial impact when followed up over the longer term. Paddock (2005:31) notes that the effect of prevention on lifetime use is small, but goes on to say that the benefits of model school-based drug prevention programs exceed their cost (RAND, 2002). Gruner-Gandhi and colleagues suggest that most drug prevention programs (including some of the 'model' programs cited in this report) give a 'misleading aura of certainty' to their programs. 46 Cook, 2002 cited in Gruner-Gandhi, 2007. 47 Skara and Sussman, 2003. 48 Foxcroft 1997; Gorman in Kleinig and Einstein, 2006. 49 The programs highlighted in this paper are only select examples of promising drug prevention programs. The following websites provide further information on evidence-based substance abuse prevention programs: http://www.nrepp.samhsa.gov/, http://www.colorado.edu/cspv/blueprints/model/overview.html, http://www.promisingpractices.net/programs_indicator_list.asp?indicatorid=4. 50 Dusenbury and Falco 1995; Botvin et al., 1995; Tobler 2000; Skara and Sussman 2003. 51 By effective we mean programs whose impacts have been measured via rigorous empirical evaluations. Ideally, a program's effectiveness is established in various settings, at different times. This is why we have not included what may be the best known school-based drug abuse prevention program: DARE. In effect, numerous evaluation studies and recent meta-analyses have shown that DARE is ineffective. The new reformed DARE, its 10th iteration, has not been evaluated yet to our knowledge. 52 Targeted interventions can be selective and/or indicated. Selective interventions are activities designed for vulnerable individuals whose risk of developing a disorder (i.e. substance abuse) is significantly higher than average. Indicated interventions are activities designed for individuals in high-risk environments or already engaged in substance abuse, identified as having minimal but detectable signs foreshadowing disorder or having biological markers indicating predisposition for disorder but not yet meeting diagnostic levels. 53 Universal interventions are activities that target the whole population group that has not been identified on the basis of individual risk. Many school-based programs are universal in nature and are delivered to all students in chosen grade levels. 54 For more information on the project SUCCESS, visit the following website: http://www.sascorp.org/school.htm. 56 See http://modelprograms.samhsa.gov/pdfs/model/Success.pdf for more information. 57 A drug use index was created by summing the scores of self-reported use of 13 drugs: tobacco, alcohol, marijuana and other drugs. 58 Please note that the original source, www.sascorp.org, did not provide information regarding the location nor the timeframe of the second study. For more information on this evaluation, please contact the author, Ellen R. Morehouse at sascorp@aol.com. 59 For more information on the project TND, visit the following website: http://www.promoteprevent.org/Publications/EBI-factsheets/Project_Towards_No_Drug_Abuse.pdf. 60 For more information on the evaluation of TND, check the following web addresses; http://www.cceanet.org/Research/Sussman/tnd.htm, http://www.cceanet.org/Research/Sussman/tnd.htm. 61 Sussman et al., 1998. 62 Sussman et al., 2002: 354-365. 63 For more information on the project ALERT, visit the following websites: http://www.colorado.edu/cspv/blueprints/promising/programs/BPP13.html; http://www.promoteprevent.org/Publications/EBI-factsheets/Project_ALERT.pdf; http://www.rand.org/pubs/research_briefs/RB4560/index1.html; http://www.projectalert.best.org/Default.asp?bhcp=1. 64 Faggiano et al., 2005; Ringwalt 2002, NIDA 2003:29; Ghosh-Dastidar et al., 2004. 65 Ennett et al., 2003. 67 Sharon F. Mihalic of the Center for the Study and Prevention of Violence, (Blueprints Initiative), has compiled a very useful document on 'Agency and Practitioner Rating Categories and Criteria for Evidence Based Programs.' The Matrix lists approximately 300 programs that have been rated by each agency as effective. 69 Botvin et al., 2001; Griffin et al., 2003. 70 Botvin et al., 1998. 72 Prevalence: proportion of persons in a population who have reported some involvement in a particular offense. Incidence: the number of offenses which occur in a given population during a specified time interval. 73 Pernanen et al., 2002.